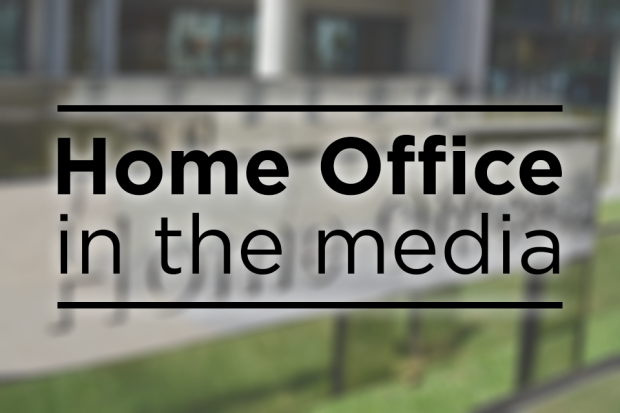 Today’s Home Office in the media stories include coverage of the Home Office’s #knifefree campaign, immigration statistics and ongoing negotiations on EU citizen registration. The Times, Mail, Sun, and Express have all reported on the Home Office’s #knifefree campaign. The Times states that thousands of teachers have been issued with lesson plans to teach school children about the dangers of knives before the start of the summer holidays. The paper also says that the Home Secretary will today chair the latest meeting of the Serious Violence Taskforce, which will focus on early intervention and methods for stopping young people being drawn into crime. The Mail leads by saying that “children as young as 11” are to get lessons about the dangers of knife crime for the first time “in a £1million bid to curb bloodshed on the streets” and also references today’s meeting of the taskforce. The knife crime lessons are part of the Home Office’s £1m #knifefree campaign which aims to highlight the consequences of carrying a knife. It’s one of 60 commitments contained in our new Serious Violence Strategy which puts a stronger focus on steering young people away from violence, while continuing to ensure the strongest possible law enforcement response. The strategy commits £40m of new Home Office money over two years, £11m of which will go into an Early Intervention Youth Fund to help communities steer young people away from violent crime. The Financial Times, Times, Mail, Express, Sun, Metro, City A.M., Evening Standard and the Independent carry pieces on the publication of the latest immigration figures by the Office of National Statistics. The Telegraph reports that the number of migrants coming to the UK rose by 33,000 to almost 300,000 in the first full year since the EU referendum. The article says this is the result of an increase in the number of people coming from outside the EU, which is at its highest rate in 13 years. The piece contains a comment from the Office for National Statistics which says that the decrease in migration from the EU is not “statistically significant”. The Guardian reports that the number of people moving to Britain from the EU is at its lowest for four years. It reports that business leaders will be concerned by the fall in migration from the EU. A quote from the Immigration Minister in response to the statistics is below. What these statistics show is that more of the people who are coming to the UK are coming for the reasons we would want – to take up a definite job or to study. More EU nationals continue to arrive than leave and as the ONS have made clear, net migration has been broadly stable since late 2016. But while it is not unusual to see quarterly ups and downs, we know more needs to be done if we are to bring net migration down to sustainable levels. That is why we continue to review our visa routes to ensure our priority remains with those who will make a real economic contribution to the UK or who need our protection. And leaving the EU will enable us to put in place an immigration system which works for everyone - businesses, communities, families and individuals. The Telegraph reports that the European Parliament is "demanding" the UK register 3 million EU citizens in Britain after Brexit without charge. According to the paper, Guy Verhofstadt, the head of the European Parliaments’ Brexit steering group, demanded the free registration in a letter to the Home Secretary earlier this month. The paper also says further asks include the automatic granting of settled status to EU citizens in Britain if they do not receive a response to their application from the Home Office after a “short cut-off date". Last month, we confirmed that EU citizens applying under the settlement scheme will only need to complete three key steps. They will need to prove their identity, show that that they live in the UK, and declare any criminal convictions. We expect application processing to be very quick - in most cases just a couple of weeks. We have also confirmed that the fee will be less than the cost of a British passport and the same as for a permanent residence document. This follows the agreement we reached with the EU on citizens' rights which allows for a fee up to the cost of an equivalent document for UK nationals.